"For six long minutes on June 30, screening operations froze at Jackson-Evers International Airport's West checkpoint in Mississippi." Bated breath. "Transportation Security Officer Scot Peele leveraged his training and experience when he detected the suspicious item while monitoring the X-ray image of the passenger's carry-on bag." The "explosive-like" item that brought you this tense Jack Bauer moment? 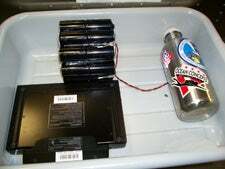 An empty water bottle and an engineer's homemade battery pack to keep his portable DVD alive on a long flight to Hawaii.